Having digestive problems? It could be your BRAIN? You may have a “gut feeling” about what I’m going to tell you, and it is likely you have used the expression “I have a gut feeling” or the saying “I feel butterflies in my stomach.” As it turns out, it is not a coincidence that these phrases involve the gut and brain. Do you know those irritable people that always seem angry or depressed, sensitive to emotion, live in constant chaos, or seem perpetually stuck in unfavorable situations? Sometimes, this is just a byproduct of poor brain function. Of course, naturally optimistic people can suffer from poor brain function too—symptoms may consist of memory loss, brain fog, fatigue, anxiety and depression. This is particularly true in circumstances when a person experiences gastrointestinal (GI) upset without a physical cause. For such functional GI disorders, it is a challenge to heal the gut without first looking at the intimate link between the gut and brain and considering the effects of stress and emotion. We have several receptors that fire into the brain, such as for sensation, sound, temperature, balance, etc. These signals stimulate the brain to relay information into the brainstem of the central nervous system (CNS), which is the area of the brain that keeps the heart beating, lungs functioning, and gut moving. The wall of the digestive system is innervated by the CNS and the enteric nervous system (ENS)—it has millions of neurons that control blood flow and secretions to help you digest food. 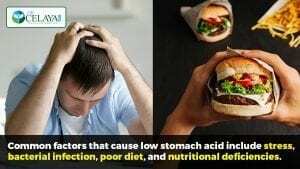 Inflammatory issues, such as in intestinal permeability (sometimes called leaky gut) or an imbalance in the gut microbiome (called dysbiosis) can impact the messages from the gut to the brain. Are you having digestive issues? If so, you can schedule a free 15 minute consultation with Dr. Celaya to see if he can help you. The multitude of neurons in the enteric nervous system not only influence our GI function but also how we “feel”—this is why the enteric nervous system is called our second brain. Though the second brain is not capable of in-depth thought, it does “talk” to the brain. Typically, diffusion of the stressful situation resets your body back to normal. But if you are always stressed, anxious, or stuck ruminating on negative thoughts, your body gets caught in a flight or flight response. If your brain is impaired (such as experiencing brain fog or memory loss), if you suffer from intestinal motility issues (like constipation or nausea), and if you have not had a positive response to conventional treatments, you may have a brain-to-gut impairment. Furthermore, if you have digestive issues, these can impact your brain chemistry and impair your gut-to-brain communication. It is common to be in a vicious cycle of both a gut-to-brain and brain-to-gut impairment; most people need to support both simultaneously. A characteristic symptom of this cycle is a decrease in the motility of the gut and consequently constipation, straining during bowel movements, and incomplete elimination. Poor elimination means that waste sits in the intestines, promoting an environment for yeast and bacterial overgrowths and the development of small intestinal bacterial overgrowth (or SIBO). Poor vagal function also encourages gallbladder stones and attacks, and reduces the effectiveness of digestive secretions; therefore, digesting food becomes difficult. A Healthy brain equals a better quality of life. When you have optimal brain function, you are happier, and you are naturally drawn to nourish your body and mind. If you would like to know more about how a detoxification and gut-repair program using the AIP diet can improve your health, you can schedule for a FREE 15 minute consultation with Dr. Celaya.